We will discuss about UiPath. We will download the free community edition of UiPath and will install UiPath Studio and UiPath Robot with this installer. After that we will create one sample project in UiPath Studio and later we will execute this project using UiPath Robot. Robotic Process Automation is the technology that allows people to configure computer software to emulate and integrate the actions of a human interaction within digital systems to execute a business process. It utilizes the user interface to capture data and manipulate applications just like humans do. They can interpret, trigger responses and communicate with other systems in order to perform on a vast variety of repetitive tasks. An RPA software robot makes zero/very fewer mistakes and costs less than an employee. RPA consists of three key technologies: screen scraping, workflow automation, and artificial intelligence. Screen scraping is the process of collecting data from a legacy application so that the data can be displayed in a more modern user interface. The workflow automation software eliminates the need for manual data entry and increases order fulfillment rates, including increased speed, efficiency, and accuracy. It reduces the chance of errors. Lastly, artificial intelligence involves the ability of computer systems to perform tasks more efficiently than a human can do. There are many good RPA tools available in the market. Some examples are “Automation Anywhere”, “BluePrism”, “AntWorks”, “UiPath”, “WorkFusion” and “Another Monday”. Many RPA softwares do not give a trial version to test before buying it. But UiPath is one of the leading RPA tools giving a free community edition. Though it has some limitations compared to fully functioning enterprise versions, it is enough to check various functionalities in UiPath. In this article, we will discuss UiPath. We will download the free community edition of UiPath and will install UiPath Studio and UiPath Robot with this installer. After that, we will create one sample project in UiPath Studio and later, we will execute this project using a UiPath Robot. 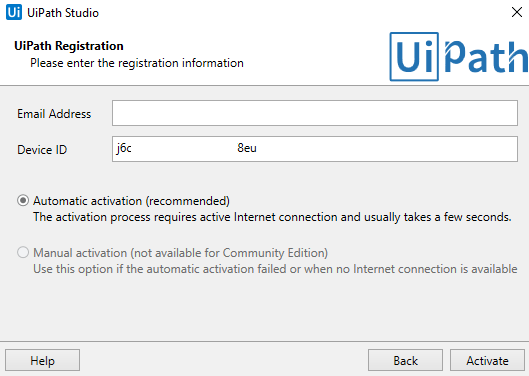 You can download the UiPath free community edition from this URL. It will ask for your contact information and after successful signup, you will get a mail to your registered email address with a download link. You can install UiPath. You can activate the Community Edition now. It will ask for the Email address. Please give the same address you used during registration. A device ID will be automatically generated, and you can keep the same. Now you can click the “Activate” button to proceed. After some moments, UiPath will be installed successfully in our machine. Please note, this will install both UiPath Studio and UiPath Robot. UiPath Studio is used to create workflows and UiPath Robot is used to execute the already-created workflows like a Robot without human intervention. We are using Google Chrome to test some UiPathfeatures in this article. We can install the Chrome extension also. Click “Tools” Menu and click “Chrome” tab to install Chrome extension. We can run the UiPath Studio now. Currently, there are 5 types of the project available in UiPath Studio. It is used to start with a blank project and we can design new automation processes inside the project. It is used to create reusable components and publish as a library. Later we can add these libraries to other automation processes as dependencies. It models an automation process as a flowchart diagram. We can define multiple flows inside this project. It will trigger an automation process in response to a mouse action or keyboard action. It creates a transactional business process that follows best practices for large-scale deployments. In this article, we will create a project with the first option “Process”. Let’s click the Process tab. You can choose the project path and give a valid name to our Project. Click “Create” button to proceed further. You can see a ribbon bar inside the project. Many menu items can be found in this ribbon bar. In our project, we will use Save, Run, and Publish buttons only. In the project tab, you can see the project dependencies and Main.xaml file. In the Activities tab, you can see many action items. 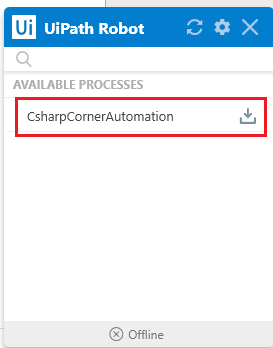 Currently, there are more than 300 activity items in UiPath. Each activity will be used for a different purpose. We will see the usage of some activities in this article. You can see many samples and code snippets inside the Snippets tab. In the Activities tab, you can see “Sequence”. A very important element is UiPath. We will define the workflow as a sequence. We can create multiple sequences in a single project. We can drag the “Sequence” to “Main” area. We can create a sample sequence now. We will get an input value from the user and show the same value in a dialog box. For that, we need an “Input Dialog” activity and “Message Box” activity. Drag this activity to sequence box. We can give a title and Label to this activity. The label will be displayed in the input box with Title value. I have given Title property and Label property to Input Dialog activity. 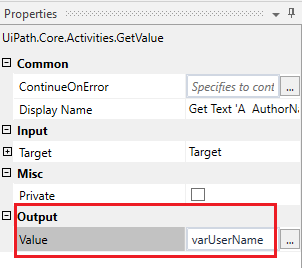 Please note all the text values in UiPath to be given inside the double quotation mark only. Otherwise, it will be treated as invalid entries. Numerical values are to be given without quotation marks. 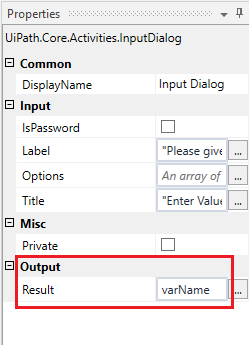 We must store the value from the input box in a variable. We can create a variable now. You can click the “Variable” button in the bottom bar. We can give variable name and variable type. Currently, there are 5 types of system variables available. We can define a custom type by selecting “Browse for Types...”. It will open a dialog box which contains many .NET default types. We will not cover this in this article. That is a matter for another article. 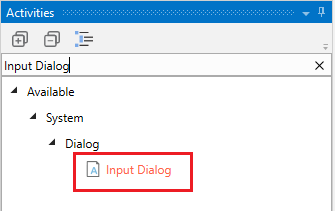 We have already created a string variable for our Input Dialog. We can map this variable with Input Dialog. 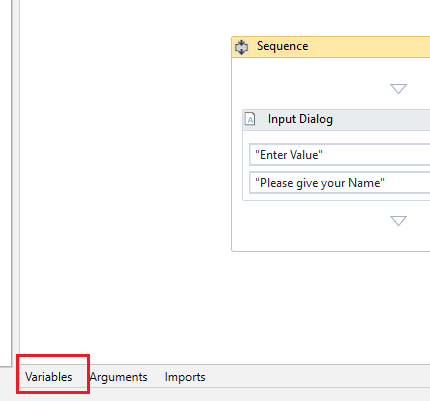 Choose the properties of Input Dialog activity and select “Result” and give the variable name. We can add one more activity for showing the result. You can search for “Message Box” in Activities tab. You can drag this Message Box to our sequence section under the previous Input Dialog activity. 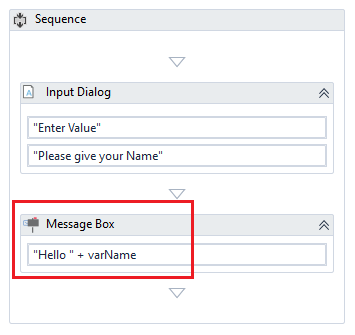 We can add a “Hello” text with our previous variable “varName” inside this Message Box. Please note two values are concatenated by “+” symbol. You can combine a constant with a variable. But two values must be in the same data type. We can run the application by clicking the “Run” button in Ribbon Menu. It will open an Input Box and ask for Name. We can give any value. After hitting the Ok button, it will display the entered value in Message Box as expected. We have seen a very simple application and understood how the UiPath project is working. We can modify the current sequence and add a few more activities. 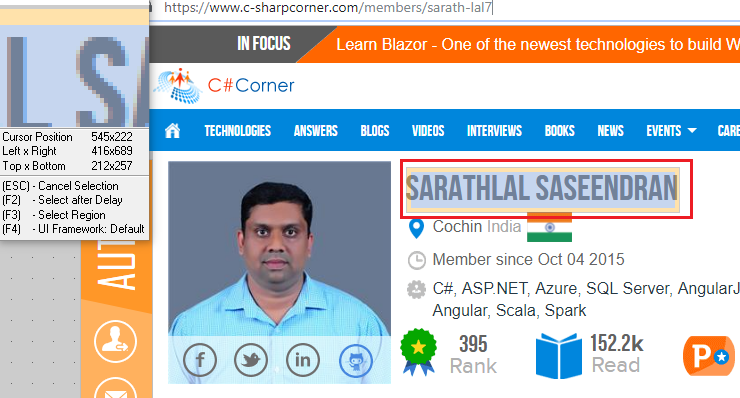 The objective of this project is to get a user id of C# Corner user from Input Dialog and get the User full name, Rank, Read and Reputation and display these values in Message Box. For that, we must add one more activity called “Open Browser” next to “Input Dialog” activity. You can search for this activity in Activities pane and drag to our sequence. Open Browser activity has a “Do” area. In this area we will add another activity called “Get Text” This activity will be used to get specific values from a website and store to a variable. We can drag this activity inside the “Do” area of “Open Browser” activity. 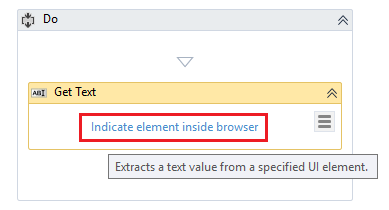 Before doing it, please open the C# Corner website with any user id and click “Indicate element inside the browser” link. 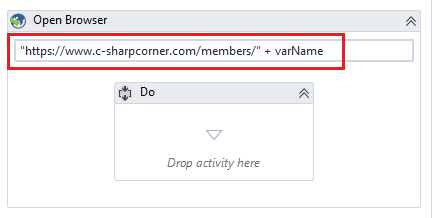 We can now move to the C# Corner website and choose the Username. After selecting the username, please click that area. The "Get Text" activity will now get the value from the website. We can assign this value to a variable. We can create a variable for User Name. Please note the Scope of this variable is “Do”. Now, we can map the variable with “Get Text” activity. We must repeat the same steps for Rank, Read and Reputation of the same user. We have total 5 variables now. We have already created a “Message Box” activity in our previous example. Now we can move that activity to the “Do” area under the last “Get Text” activity. We can now modify the Text property of Message Box activity. I have created a string expression using our existing variables and additional text. Please note I have used “vbCrLf” constant. This is a VB.Net system constant. UiPath supports many VB.Net and VB6 constants. We can run the project. It will ask the C# Corner User Id. After giving the User Id, it will open C# Corner URL in a new tab and get the values of that user and display in Message Box. We can publish the project by selecting all the sequence activities and clicking “Publish” button in Ribbon menu. It will open another window and you can choose the “Robot Defaults” and click the “Publish” button. Our project will immediately publish to default package location. Please keep this default location as it is so that later we can run the UiPath Robot to execute this package. 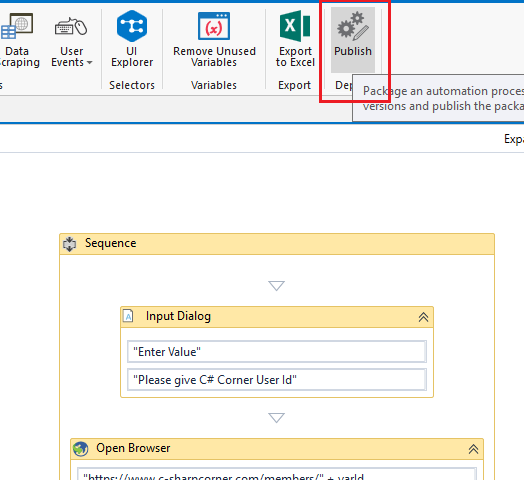 You can open UiPath Robot from Programs and click “Download” button to get the latest package. After getting the new package you can run the package in UiPath Robot. This time I am giving the User Id of the popular author "Shri Dhananjay Kumar"
After giving the User Id, click the Ok button to proceed. It will open the user’s profile in a new tab and get the values and show in the message box. 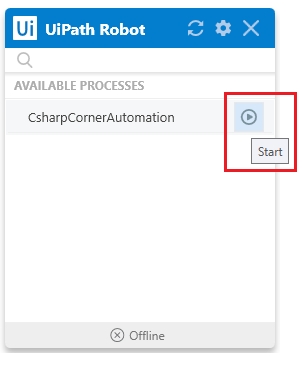 In this article, we have installed UiPath Studio and UiPath Robot in our Windows machine and we created a sample UiPath project with few activities like “Input Dialog”, “Message Box”, “Open Browser” and “Get Text”. We have seen how to create Variables and how these variables mapped with activities. We have also created a package from the current project and we have executed this package from the UiPath Robot. This is a very simple UiPath project and the main purpose of UiPath to create complex projects. But I hope you will get a basic idea of UiPath from this article. We will see more exciting features of UiPath in upcoming articles.